Upgrades the value and appeal of your home with tile flooring from our expansive flooring showroom. Transform your place of business or home with our stylish and durable collections of ceramic tile and porcelain tile flooring. These floors add modern style, comfort, and classic sophistication to any room you are renovating. When you are ready to begin your design journey, visit our showroom and bring in any plans or samples you have. We can then discuss your options and locate the right materials for you. As a locally owned and operated store, you can count on us to fulfill the design and functional needs you have for your floors. We are dedicated to seeing our customers happy. Whether you already have a design plan in place or need guidance, you can rely on our store associates to help you in any way you need. Family is an important part of our business. When customers visit us, whether they are new or regular shoppers, they can expect to be treated like family. Listening to the ideas and vision you have for your own space is paramount in making sure we provide the right products to see your project through to succession. With the buying power of a franchise and the customer service of a mom-and-pop store, you are sure to find everything you need for your next flooring project. We make it easy to match your distinctive living space with the right color and texture of tile flooring. Our team of design specialists takes the time to listen to your needs. When we fully understand your design plan and your family’s lifestyle, we help you find the right flooring that fits your needs in looks, performance, and price. Whether you are replacing the floors at the entrance to your business or redesigning your formal dining room, our tile flooring creates the stunning look you want and expect. There are many advantages to either porcelain or ceramic tile depending on the nature of your project and design plan. When you need a versatile flooring option that allows you the latitude to mix a variety of shapes and spaces, our selection of ceramic tile is the answer. This elegant variety of floor tile is easy to cut and install. Feel free to expand your design plan and achieve a look that is unique to your home or business. This material has been used in homes for centuries, and it establishes a look that makes your home attractive and appealing for generations to come. With its resistance to moisture, stains, and spills, it stands up to the busiest of households. In addition, our ceramic tile is available in a broad range of colors that match any design plan. For a strong foundation for an active family, our selection of beautiful porcelain tile provides you with a lasting solution. This natural tile is as easy to clean as ceramic, but it is a denser type of flooring. This extra strength makes it a good choice for outdoor spaces. With a color that is baked into the tile, any scratches or dings will maintain the color of the surface. That helps your floors keep a solid look for years to come. They also help you avoid subjecting your kids and pets to harsh chemicals and cleaners. Their easy maintenance is also what attracts them to homeowners and business owners. Our porcelain tile floors only need some warm water and a mop to clean. This helps you save time each week, and your family will breathe easier. Slate tile, along with porcelain and ceramic, offers homeowners and trade professionals strength, durability, and longevity. As long as the tile is given its proper care and attention, there’s no reason why it shouldn’t last for many years to come. A home is an investment and. You don’t want to continually sink money into it if it isn’t going to pay off in the long run. When you install slate tile or any type of tile for that matter, you get sophistication, resilience, and beauty all in one floor. Strength and beauty aren’t the only qualities tile possesses. When you install tile in your home, you’re not just upgrading the look of our home, but you’re also making it healthier. Tile is known for its ability to preserve indoor air quality. Volatile organic compounds are either present very little or not at all in tile because it is fired in high-temperature kilns. The combined characteristics of tile make it an excellent choice for the homeowner, contractor, or designer that wants beautifully designed, hygienic floors. Our knowledgeable associates are prepared to answer any questions you have about our different tile styles. 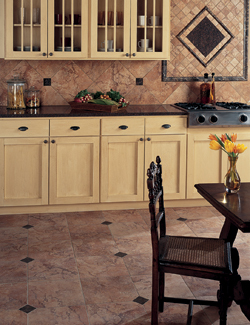 Some of the nationally recognized brands we carry include Star Values and Floorcraft. Protecting your flooring investment is now more affordable than ever when you take advantage of our professional tile flooring installation. We help you get the look you had in mind when you walked into our showroom, and you avoid the potential costs for repairs down the road. Our team has the tools and experience needed to install floors that last. We are committed to your complete satisfaction, and that includes affordable tile flooring installation done right the first time. Additionally, your flooring installation is covered by our unprecedented Confidence Plus Warranty, which means if you are dissatisfied with your new 4-Star or 5-Star floor within 30 days of the install, we will replace it at no cost to you. We also offer a Price Protection Guarantee. We are committed to being the most affordable floor supplier in the area. With that said, if you purchase a product from us and find the exact same product at another store, let us know. We will gladly refund the difference and make it right. Contact us today to learn more about tile flooring. Our team offers free estimates to customers located in El Cajon, La Mesa, Santee, Alpine, and San Diego, California, as well as the surrounding areas.